Got what it takes to make it happen? 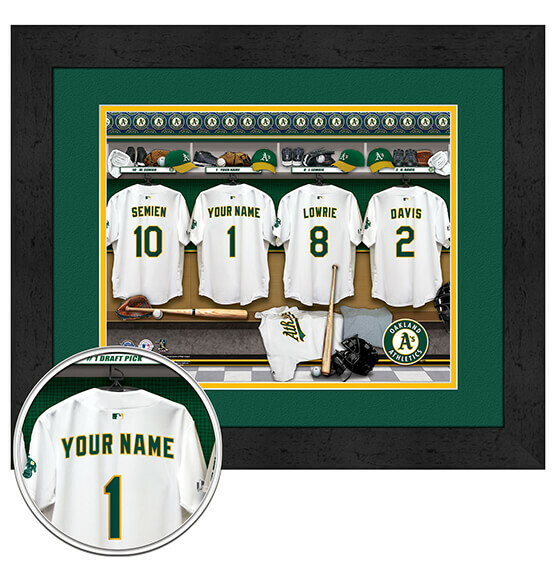 Even if you don't make the cut, this Oakland Athletics Personalized Locker Room Wall decor will highlight your name on the back one of these four Oakland A's jerseys in a delightful locker room scene. Customizing this premium print is easy: just let us know what name to print up to 12 letters and we'll do the rest. This memorable print comes with a digital double mat in team colors and features an elegant black frame that looks great anywhere. Purchase for yourself or any Oakland A's fan in your life for a cherished piece of art you'll be proud to show off.